A local business bromance has led to some Whanganui "good bastards" starring in a nationwide television and online advertisement campaign. 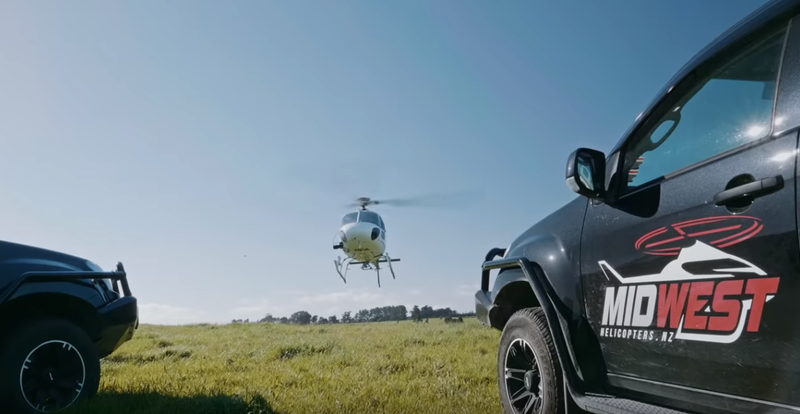 Harvey Round Motors, the Isuzu franchisee in Whanganui, nominated its customer Mid West Helicopters to feature in an Isuzu Utes New Zealand advertisement for Isuzu customers who are "good bastards". Mid West's nomination was successful and Dean "Deano" Lithgow, one of the company's directors and pilots, and other members of the Mid West team found themselves starring in two "Good Bastards" advertisements. Isuzu says the kiwi phrase is used to describe "someone that is loyal, generous, honest and ready to help out which is exactly what Deano and the Mid West team are". While the advertisements are Isuzu promos, the work Mid West does in agriculture, search and rescue, firefighting, controlled burn-offs, forestry operations, frost control and the "Let's get 'em down" education campaign to remove farmer-erected overhead lines and aerials all get a mention. Lithgow also gives a shout out to Harvey Round Motors for going "above and beyond" in meeting Mid West's vehicle requirements. The advertisements have screened on television and are available on YouTube.